As a parent, you have an important tool right at your fingertips to help you in your special education experience. This simple tool, developed over time, can be one of your greatest assets in advocating for your child. It is your parent journal, in which you record your impressions and descriptions of your child’s behaviors, moods, struggles, achievements, and any other notable information. You may not think that day to day life is worth recording or perhaps you think you are too busy to find the time to write journal entries. We want to tell you that this is valuable information that grows in importance over time. Remember the scene in Thornton Wilder’s play Our Town in which the main character Emily goes back in time to see her twelve year old self at home with her parents for one day? It is a poignant scene of an adult woman seeing herself as a twelve year old girl with her parents. She notices how young everyone is and all the details in her childhood home. She sees everything with fresh eyes, from a different perspective provided by the passage of time. What was absolutely ordinary and common years ago suddenly takes on a new meaning and significance for her. 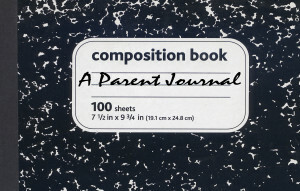 Your parent journal can do the same for you. We began our journal when our son started special education in preschool. Initially we just recorded details of phone calls and letters related to school, but as time went by we started recording the details of everyday life: what foods our son ate and his reactions to them, his activities, and how he slept. At an early age he had food allergies, so keeping a journal was essential to pinpoint his sensitivities to certain foods. The journal evolved as he started elementary school, with details about his difficulties learning to read and write. We recorded our impressions of how schoolwork was going, parent-teacher conferences, and Team meetings. The more we became involved in special education, the more we wrote, since there were so many details to keep track of. Over time, keeping our journal became a habit. We wrote detailed notes and impressions immediately after Team meetings and phone calls with school personnel. We recorded our son’s mood after he came home from school each day. We followed up these experiences with letters to school personnel. "By middle school our entries revealed that school personnel were giving us conflicting information about our son’s school experience..."
Writing factual notes became an important part of the special education experience for us. By middle school our entries revealed that school personnel were giving us conflicting information about our son’s school experience, and helped us understand that his placement was not appropriate. When we began to work with a lawyer to seek reimbursement for a more appropriate placement, she was able to use the facts and dates to strengthen our case. Through her, we began to appreciate the importance of the “trail of paper” we had created. When our school district served us a discovery request we had the information they requested at our finger tips. Notes that we had taken years earlier suddenly became significant and had a new meaning, just like Emily’s experience in Our Town. For example, in third grade our school had sent us reports saying how well our son was doing, but in our journal we had recorded details of his frustration at not being able to read at grade level. We could clearly see his struggles with school assignments. He was not excelling in all academic areas as the school had claimed. Testing by professionals independent of our school district confirmed what we had written. Our journal entries were an important part of our case. Your child will change over the years, but change can happen gradually. Sometimes weeks or months go by and you feel like nothing different has happened. But growth is always happening, so be aware, observe your child, and start recording the details of his or her life. You may feel too busy, but if you make it a practice to spend even five minutes a day recording your impressions, either in writing or in a recording, over time you will see details emerge that will pay big dividends in the future as you advocate for your child.